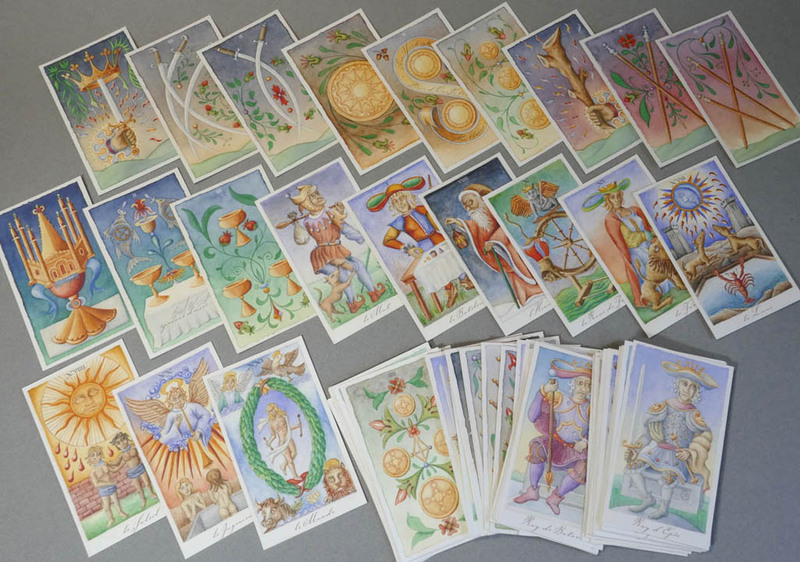 I've acquired a copy of the 22-card Bill's Tarot by Bill Wolf, produced in a limited edition of 12 in 2000. The deck is in Kaplan's Encyclopedia of Tarot, vol. III. It's a knockout. Bill is working on pips with an eye to a new edition. Take a look. I love the appearance, straight on, and there is a lot of iconography here, also. Bill has done some painting here at the forum. The folder and the first half of the cards. This is number 6. Let me know if there's any card you'd like to see in greater detail. Overall this gives the feeling--somehow--of enamel, although the medium is nothing like it. I think it's the "clean" quality of the colors. I also feel like I know these people. They live in a little self-contained universe. They seem familiar somehow. You're very fortunate to have been able to acquire a copy, Debra! Though I bid reasonably high last a copy went on eBay, I believe I may have been bidding against only one other person in the end, but had to stop within my limits. Thanks for showing these - it's certainly a deck I would have liked to have had the opportunity of obtaining. Bill did send me a 'consolation' painting... and therein can surmise how wonderful the quality of the work is - something that an electronic image cannot do justice. I remember when OnePotato first showed up on AT, and I clicked his profile and eventually found his deck. 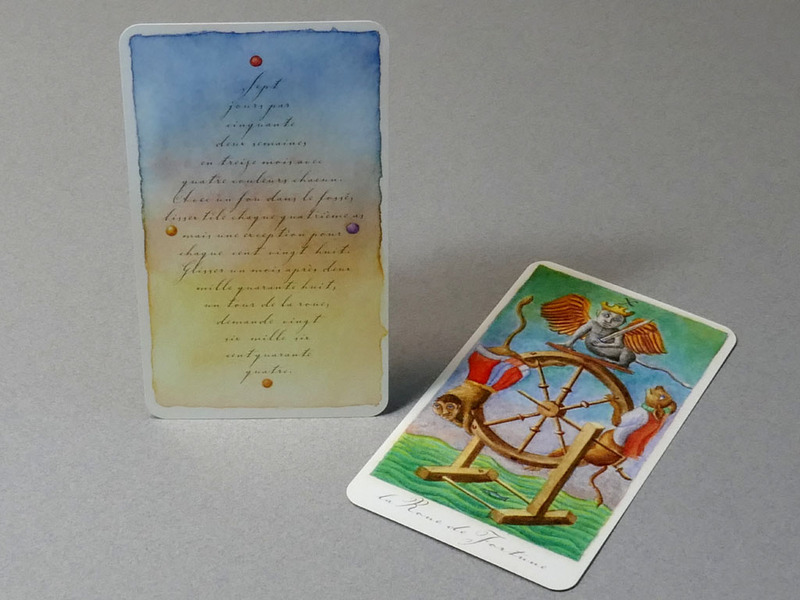 I couldn't believe how beautiful "Bill's Tarot" was. Jean-Michel and I discussed the incredible quality, the beauty, the craftsmanship. I can't believe you have one of the original copies Debra, what a rare treasure. I've seen OnePotato's work in progress on the pips, and I have to say they are breathtaking. When complete, this is going to be an incredibly popular deck. I hope OnePotato will share with us any thoughts he has about the process for deciding what to present on the cards, his choice of colors, any insights really that allow us a peek into the creative process that results in such wonderful work. It's simply stunning, I love it. ...I hope OnePotato will share with us any thoughts he has about the process for deciding what to present on the cards, his choice of colors, any insights really that allow us a peek into the creative process that results in such wonderful work. I tried to reach you a couple of years ago, but you weren't around. I finished the art for the deck a few years ago, and have also written a book that accompanies it. It's 11 small volumes. Some of what you ask is covered in & around there. Unfortunately, at this point, I'm still struggling to find a suitable way to make it generally available. It's somewhat complicated to produce, and given that, I'm not sure what the actual demand for such work would be. Thanks for putting the link to my website on the landing page. The Blog there also addresses some of what you've asked about. Your new re-design for this place is very nice. And it's nice to see you back here again. It's typical of your work for even the accompanying information to be provided in such a compelling manner, the design and typography are beautiful. I love the accordion fold-outs and the stitching. Lovely. If you ever feel like discussing it, I'd be delighted if you'd share some of your thoughts from spending so much time working so closely with these cards... What patterns did you notice? What surprised you? What, if anything, did you modify and why? You deck is lovely, congratulations. When I re-started the project back in 2006, I thought of the deck and "accompanying material" as equal partners. Both would develop together, each as part of the other. I imagine this approach differs from other tarot decks being produced today, where artists or "creators" typically focus on finishing 78 cards, then write something about what they did and/or what it means to them. In practical terms, this meant that I would make a point of understanding as much as possible about what I was doing, and develop reasons for doing things. One of my fundamental goals was to present an interpretation of tarot design and symbolism within the context of a long view of history. 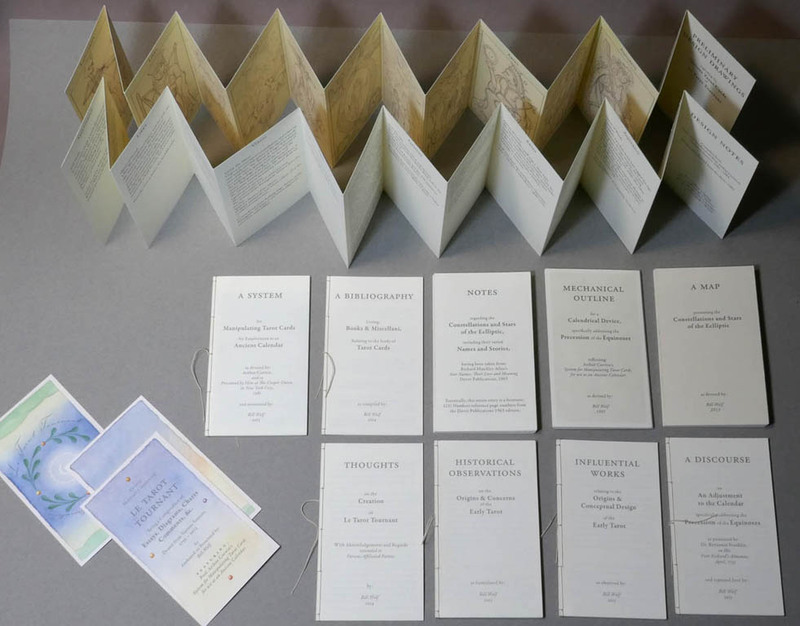 The written part addresses that with some degree of depth, and provides a foundation and intellectual background basis for what is seen in the card images. They both say the same thing, albeit in different ways. This is what's interesting to me about making a tarot. The art was difficult because it essentially (re)creates a visual language. As far as observing patterns, that's a difficult question. I spent about a year working out a system for the pips that was rooted in the traditional pattern, and then a few years figuring out how to execute that system as my own card designs. I hoped to produce a result that had many layers, but not so it felt contrived. In the end, I don't feel that I've invented anything particularly new, but rather enhanced what was already present in a well-founded interpretation of a traditional design. I wanted to make something that someone a few hundred years ago would have no trouble understanding. What surprised me most is how far out in the countryside that I find myself now.